Leadership Bay County aims to provide the knowledge and motivation needed to lead our community through politics, business and non-profit organizations. Leadership Bay County appeals to people of diverse backgrounds who have an interest in the future of our community. The nine-month curriculum is designed to help participants better understand our community by reviewing its history and examining entities and systems. Speakers from businesses, government, education, law enforcement, natural resources, arts, and human services provide information at each session. Participants are also challenged to develop leadership skills and contribute to our community by selecting and completing a class project. Since the program began in 1987, an average of 20 people have attended and graduated from Leadership Bay County each year — and many of these attendees are serving in leadership capacities throughout the community. The program has several requirements. Attendance and active participation in the two-day kick-off retreat and at least eight of the nine day-long sessions (one per month) is required, as well as completion of assigned homework. 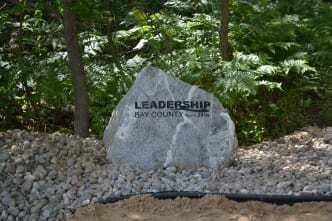 Leadership Bay County begins each Fall and graduates its participants in late Spring. The application is open to any adult member of the community who is interested in the past, present and future of our community and who is looking to become personally involved in leading it. The Bay Area Chamber of Commerce is happy to offer the opportunity to fund and complete a project of your choosing. Professionals enrolled in Leadership Bay County will be exposed to your organization, potentially creating lifelong advocates for both themselves and your business. They will work hard to ensure the project is completed successfully. Keep in mind, the project selection process is competitive, so the more clear and concise, the better your project will fair. Click here to download the 2018-2019 program brochure. Click here to download the 2018-2019 application. The deadline for applications is approaching quickly!